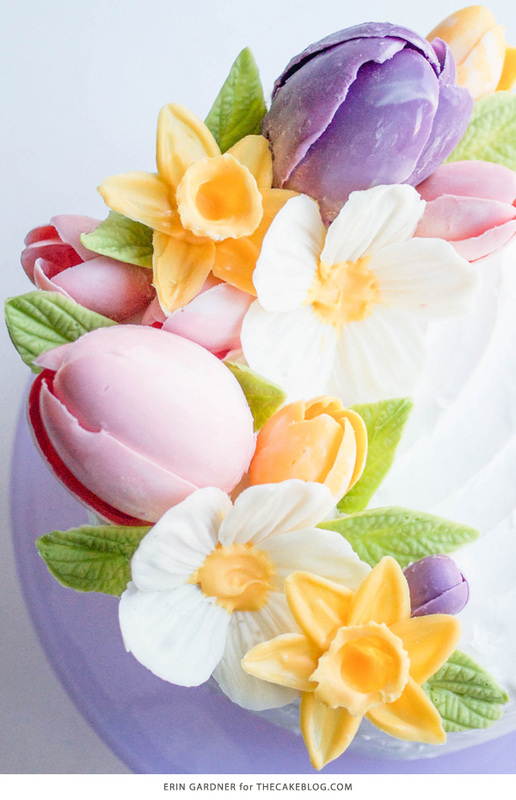 Chocolate Daffodils – how to make a chocolate flower cake, featuring chocolate daffodils. A new tutorial by our contributor, Erin Gardner! My obsession with chocolate flowers continues! It’s been so much fun for me to continue working with this medium, coming up with new and beautiful designs that are also completely delicious. 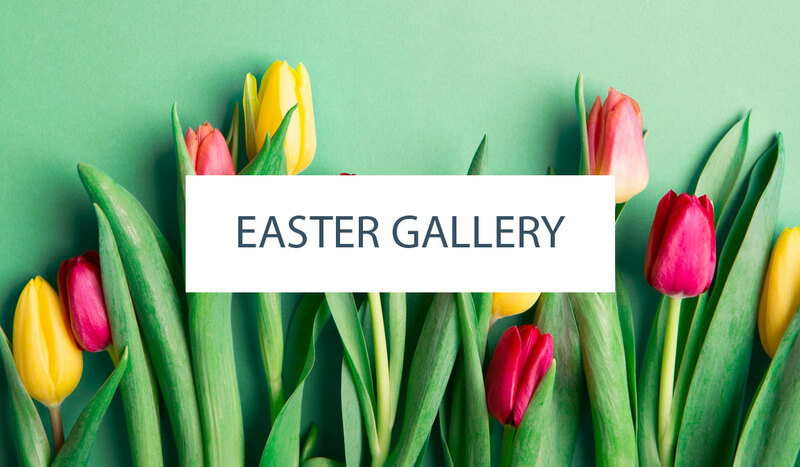 These flowers are absolutely perfect for Easter and spring celebrations, where candy is already part of the party! 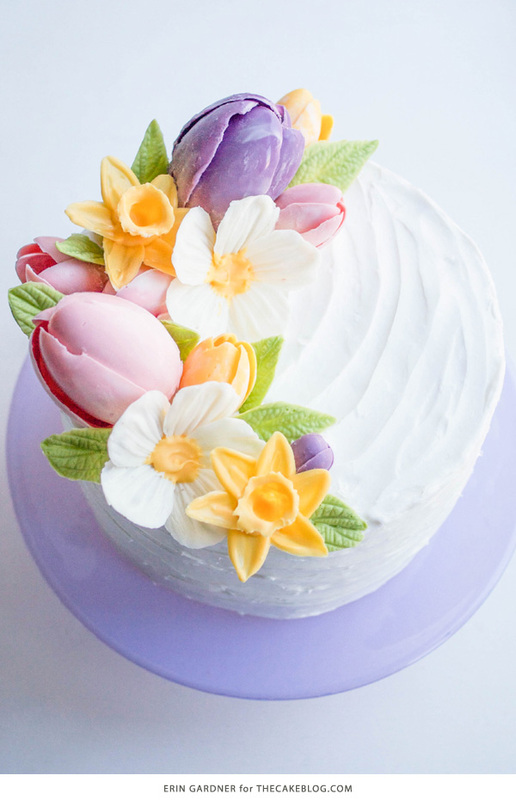 While the techniques that I use to create these flowers are rooted in fine chocolate work, they also work incredibly well with candy melts. Here, I’ve made candy daffodils using chocolate flower techniques. 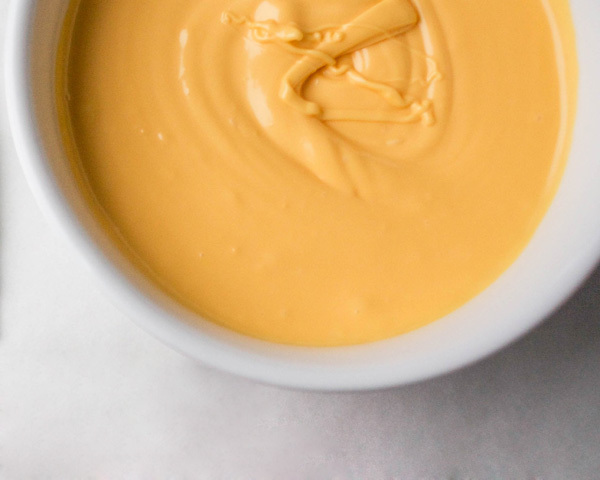 You could also use tempered white chocolate colored with candy coloring or tinted cocoa butters. Tear off a piece of heavy duty aluminum foil that’s about 3-inches wide. Tear that strip in half and then fold one of the pieces in half. You’ll have a doubled-up square of foil that’s about 3-inches by 3-inches. 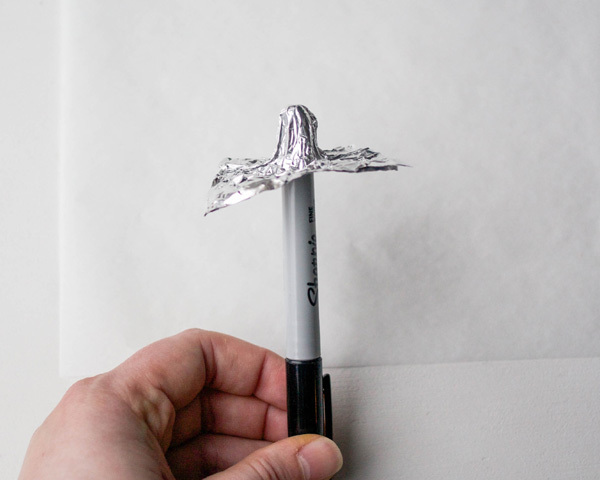 Smush the foil over the back of your marker. You could also use your finger, a lip balm, really anything that gives you a similar shape. Press the foil firmly around the end of the marker while leaving the edges flat. This creates the trumpet shape that will form the center of the daffodil. Melt the yellow candy melts in a small heat-proof bowl. 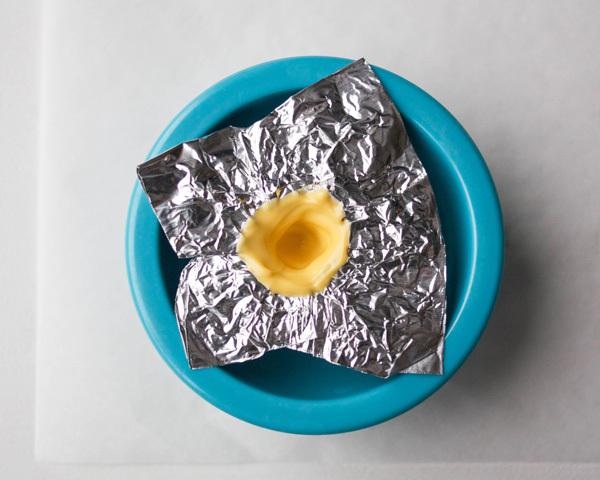 Using your finger or a paint brush, fill in the hole in the foil with melted yellow candy. The back of the brush actually works better for me, since the bristles can get gummed up pretty quickly. Make sure all of the edges are nicely coated. You shouldn’t be able to see any of the foil through the candy. 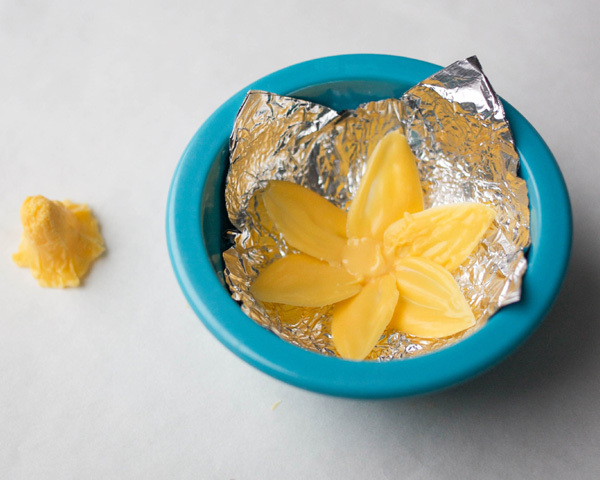 Bring the melted candy up over the edge of the foil to create the top edge of your daffodil center. 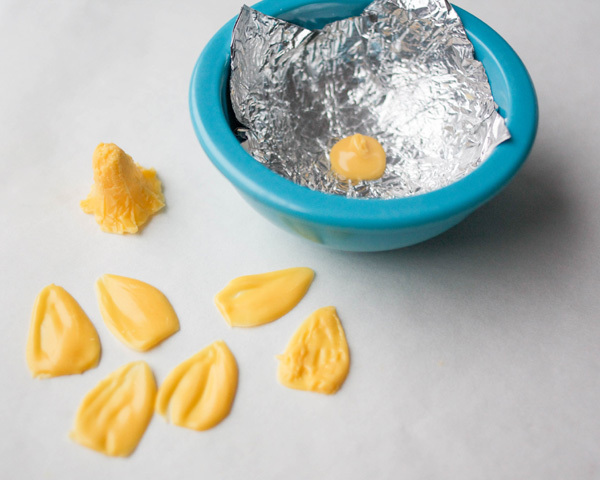 Set the filled foil piece into a bowl to dry. 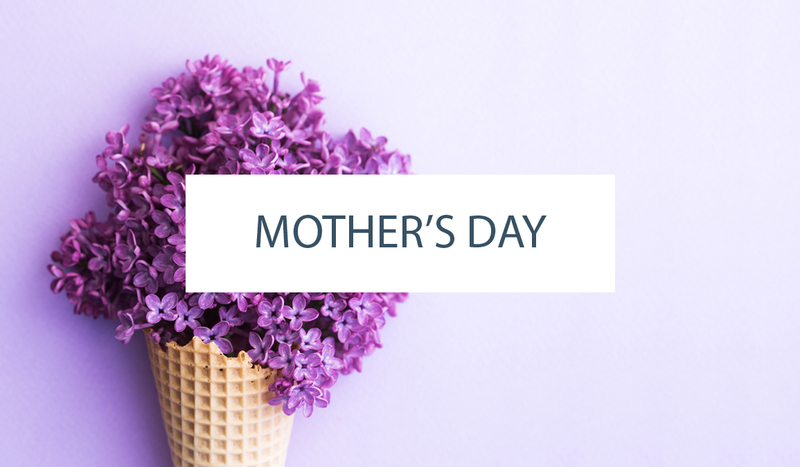 To make your petals, dip the flat side of the knife into the melted chocolate so that about 1-inch of the knife is coated. Lay the coated side of the knife against the edge of the parchment paper. Pull the knife down and away, smearing the candy onto the paper in a petal shape. You can go back in to add more candy, or rock the knife back and forth to create the shape you’re looking for. Repeat this process until you have 6 petals total. 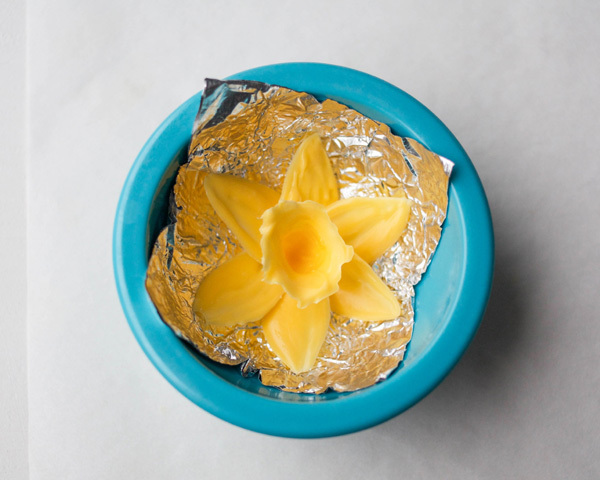 To un-mold your daffodil center, gently pull at the top edges of the aluminum foil. Move around the center, continuing to gently pull away the foil. Once the top edge is freed the bottom of the center should pop out. Use the remaining piece of foil to line your small bowl. Pour a dime-sized amount of melted yellow candy into the center of the bowl. 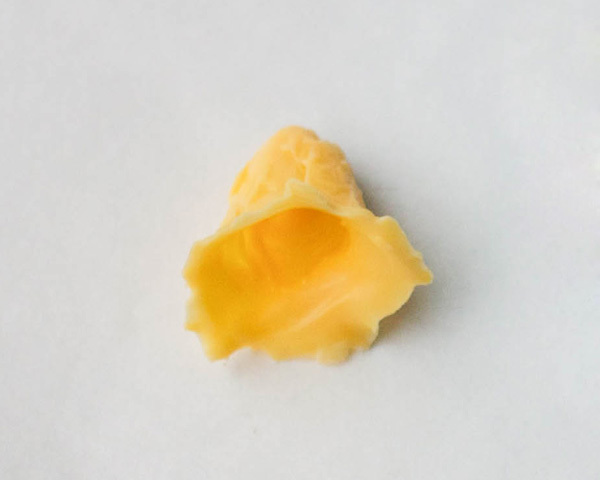 Place the flat end of a petal into the candy puddle. Repeat with the rest of the petals, overlapping the edges as you go. 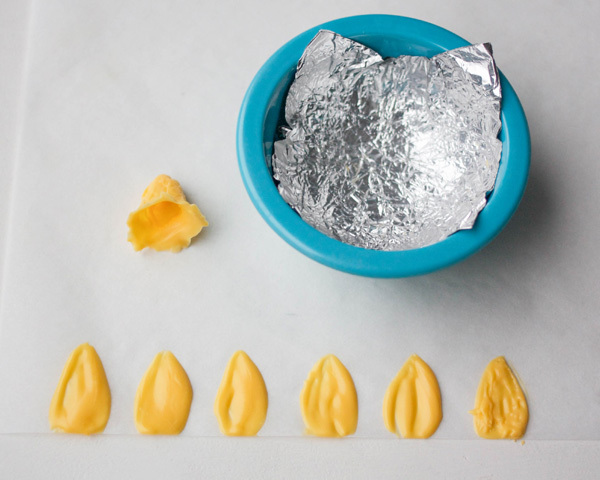 You can also dip the end of the petal into the melted candy before placing it for added stability. Add a little more melted candy to the middle of the newly formed flower. Position the center piece, standing upright. It should fit snuggly in the middle. 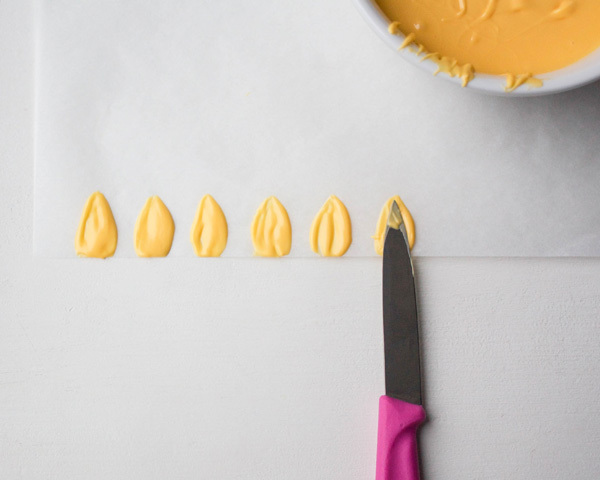 Set aside your finished daffodil until it’s completely dry. To remove, lift the foil cup from the bowl. Place one hand under the flower to steady it. 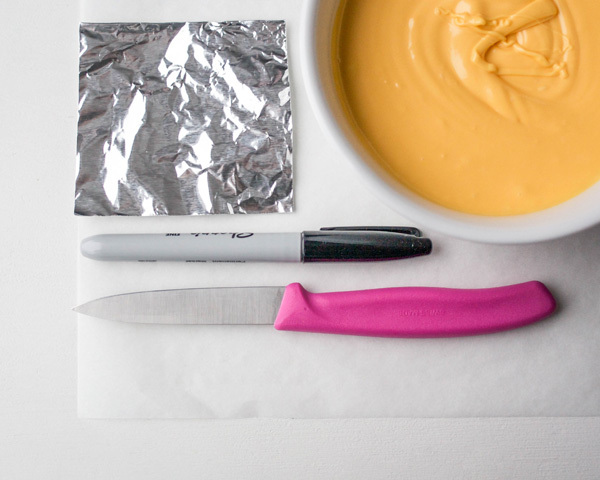 Peel back the foil with your other hand. 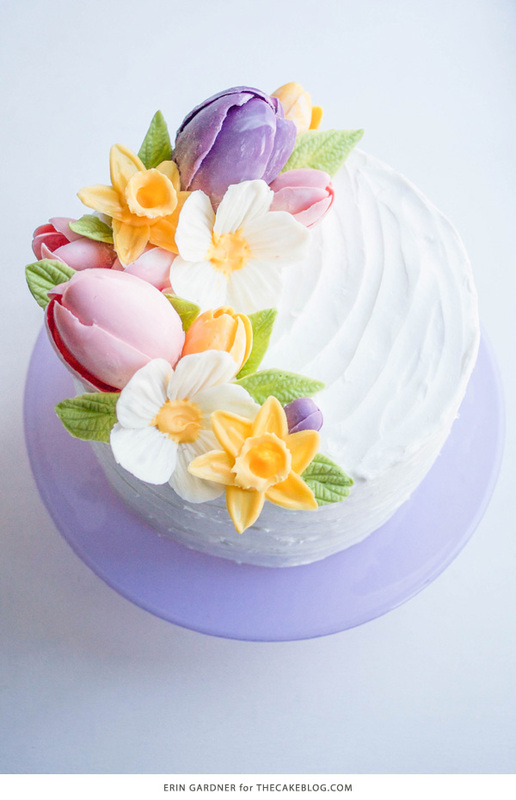 Use your tasty and beautiful daffodil to top a freshly iced cupcake, or as part of a beautiful chocolate flower arrangement, like I’ve done here. You can learn how to make the chocolate tulips here, a giant chocolate flower here and many other flowers in my online Chocolate Flowers Class. Daffodils come in all sorts of color combinations, so feel free to mix up the colors and get creative with your flowers! Chocolate or candy flowers can be made well in advance. They’re best stored in an airtight container at room temperature. They’re good for as long as the expiration date on your bag of candy or bar of chocolate. Thanks! I plan on making my niece an edible corsage for her dance recital this weekend. These might be just the extra touch! I’ve been playing around with wafer paper flowers around a dumdum lollipop center so your post has great timing for me! It’s lovely and I would love to do this but I know from experimenting with melted chocolate that the shape do not stay put because after a few minutes being at room temp it starts to welt and looses its original shape. How do you keep the shape stable? Hi! It sounds like you’re melting regular chocolate and using it without tempering it first. Tempering is the process that makes chocolate stable at room temperature. I teach how to temper in my Craftsy class about chocolate flowers. You can also find other tutorials online. Candy melts are able to be melted and shaped without tempering, but regular chocolate needs to go through that process. Thanks! Thank you for clarifying but I don’t understand. Would you be so kind to give me a link to review the differences. I ve done some search on “tempering chocolate” and I’m going around in circle. Thank you again. I’m so eager to resolve this chocolate problem I’m having. I honestly had to do a double take with these flowers, I can’t believe they’re chocolate. They most certainly look good enough to eat! Thanks for sharing this article. The daffodil looks amazing. Currently am searching easy cake recipes for kids. 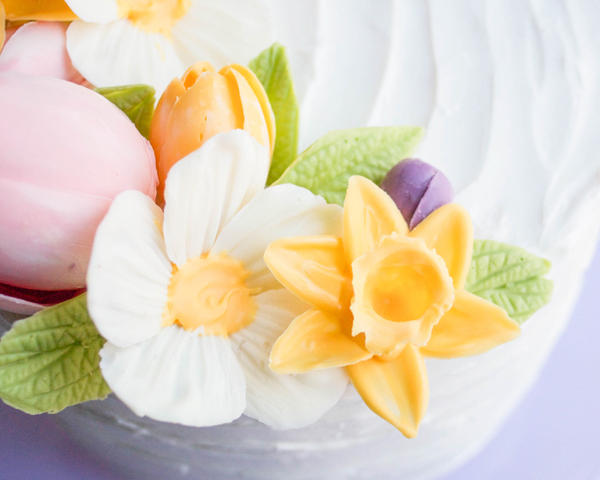 These beautiful daffodils are a great addition to the cakes for children. Your description makes it sound so easy, I’m sure it’s not! They look fantastic. It’s my sister’s birthday in a few days. Might try making this one. Thanks for sharing! Wow! …..Very nice blog and blog content, i love chocolate flavor it is so yummy and delicious. Hi. How did you make the leaves? Are they candy melts ?